For patients with horseshoe kidneys, the criteria for diagnosing a ureteropelvic junction obstruction and the indication for surgical intervention are no different than for patients with normally positioned kidneys. Given the anomalies of the blood supply to the horseshoe kidney, a preoperative angiogram or computed tomography angiogram with three-dimensional volume rendering should be obtained. An understanding of the vascular supply is important when mobilizing the horseshoe kidney and dividing the isthmus. Any crossing vessels should be identified and avoided while mobilizing the proximal ureter. The medial and ventral location of the ureters in a horseshoe kidney is preferred when performing laparoscopy pyeloplasty. Although an isthmectomy is part of the conventional surgery for a ureteropelvic junction obstruction in a horseshoe kidney, these initial reports suggest that the isthmus may be left intact during laparoscopic pyeloplasty. 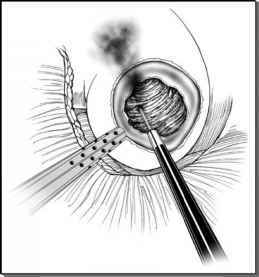 FIGURE 1 ■ Transperitoneal laparoscopy can be performed using two 12-mm ports and one 5-mm port. The camera is placed through the center port. If a prominent isthmus contributes to the obstruction of the ureteropelvic junction, an isthmectomy should be performed. The involved renal moiety can then be moved several centimeters laterally before performing the ureteropelvic junction repair. However, nephropexy is not necessary. Prior to starting the laparoscopic portion of the surgery, flexible cystoscopy is used to place a standard guidewire past the ureteropelvic junction. The guidewire is secured to the Foley catheter in a sterile manner to allow manipulation of the wire by the surgeons during the laparoscopic repair. We prefer to perform the surgery with the patient in a modified flank position using a transperitoneal approach. 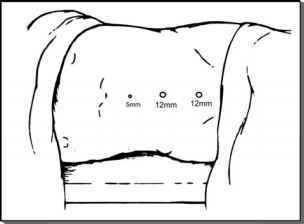 The surgery can be performed using three midline ports, which include two 12-mm ports and one 5-mm port (Fig. 1). The 5-mm port is the superior-most port and the middle port, used for the camera, is placed through the umbilicus. Depending on the location of the kidney, the three port sites can be adjusted while maintaining the relative position of the three ports. The colon is reflected medially to expose the kidney and the isthmus. To perform the isthmectomy, the isthmus should be separated from the aorta. The involved renal moiety may need to be mobilized to allow the isthmus and aorta to be separated. The isthmus can be divided using electrocautery, ultrasonic shears, or endoscopic staplers. Hemostasis can be achieved at the cut surface using a combination of argon-beam coagulation, fibrin glue, thrombin, cellulose sheet, and intracorporeal sutures. The involved renal moiety can then be moved several centimeters laterally before performing the ureteropelvic junction repair. However, nephropexy is not necessary (12,23). A Heineke-Mickulicz repair is well suited for short intrinsic segments of stenosis; a Y-V plasty is well suited in patients with high ureteral insertions. An Anderson-Hynes dismembered pyeloplasty is ideal for patients with a redundant renal pelvis. The ureter and renal pelvis should be transposed over any crossing vessels that may be present. If a renal stone is present, the stone can be removed through the endopyelotomy using a flexible cystoscope and a basket. The collecting system can be reconstructed using 4-0 Vicryl sutures placed in an interrupted fashion. After performing the posterior half of the ureteropelvic anastomosis, a double-J stent is passed over the previously placed guidewire. The placement of the stent is visually confirmed before completing the anterior portion of the uretero-pelvic anastomosis. A surgical drain is placed in the retroperitoneum before repositioning the colon. The drain can be removed on postoperative day one if the drain output remains low following Foley catheter removal. The ureteral stent should be left in place for approximately six weeks.